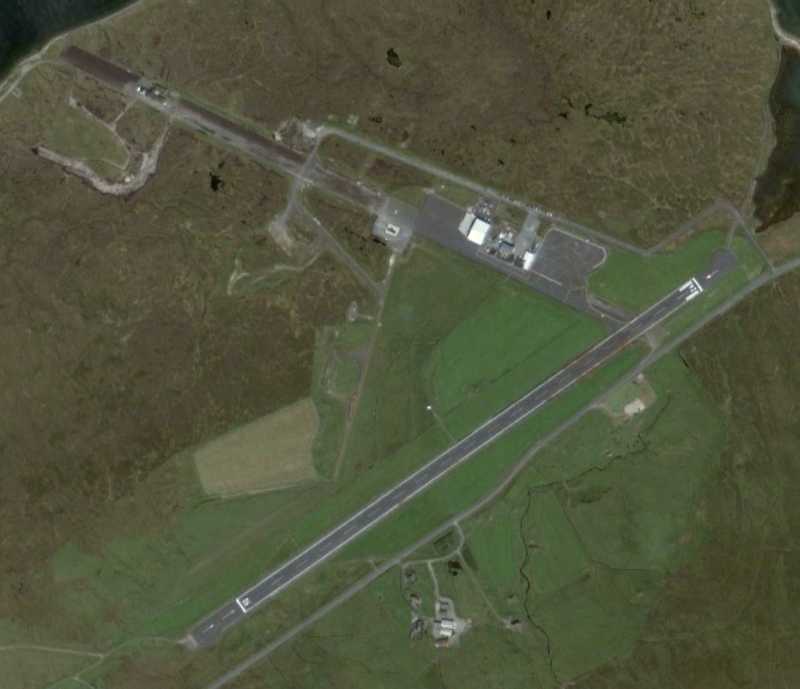 RAF Scatsta and RAF Sullom Voe (also known as Scatsta Airport, ICAO: EGPM) were two twinned airfields in the north of Mainland, Shetland. The airfields are listed here as one, as they were located next to each other and used each others facilities. The airfields came into being around 1938. 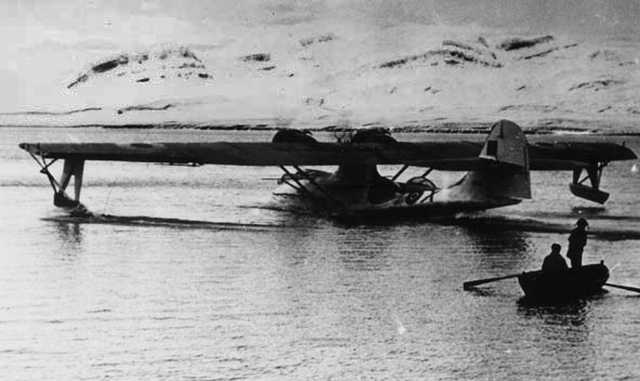 RAF Sullom Voe was built as a major flying boat installation in the north of Scotland. It was setup by the RAF quite hastily. The first enemy bombs to fall on British soil were dropped in a raid on this airfield. Four bombs fell in a field at the village of Sullom, November 13th 1939, the only casualty was a rabbit. Between 1939 and 1940 the personnel accomodation was set up in an ocean liner, the SS 'Manela'. They moved out of the ship when a camp was established at nearby Graven. To provide cover for the flying boat station a fighter station was envisioned. This was to be a seperate airfield, called RAF Scatsta, and it became the most northernly air base in the UK. Construction began in early 1940. The original plan was to built 3 runways, but because of a labour shortage and the difficult terrain this plan was scrapped. Instead, the airfield received only 2, and it was severely cut on the number of dispersals. When World War II broke out it was planned to station a fighter unit at the airfield. German plans would usually come low level and undetected however, until they were spotted by the Royal Observer Corps. By that time it was generally too late to scramble fighters, so they were kept at RAF Sumburg. The first official landing of an aircraft at RAF Scatsta was a Hornet Moth with Air Vice Marshall Breese, Officer Commanding No 18 Group RAF Coastal Command, to carry out an inspection of RAF Sullom Voe on April 25th 1940. Various communication flights by Anson, Dominies, Whitley or Hamden followed in the months after. A Walrus amphibian aircraft was stationed on air sea rescue stand-by duty. In July 1941 construction of the second runway was begun (completed in April 1942). During the construction of the airfield Army Engineers laid pipe mines known as 'Canadian Pipe mines' under the runways and associated taxiways. They were laid at 50 yard intervals with the intention to blow up the runways in case of a German invasion. 3 large hangars (out of a proposed 5) were built at Scatsta. One was used by RAF Sullom Voe for maintenance of their flying boats. The other two were general maintenance hangars for Scatsta. The airfields had no control tower, but an Ops room and control hut was located to the southeast of Sullom Voe. RAF Sullom Voe was home to several squadrons, flying Shorts Sunderland and Catalina flying boats. When World War II began 210Sqn was operating at the base with Sunderlands. The unit moved out to RAF Oban in July 1940, but returned between February and October 1942 and again between January 1944 and June 1945. During the latter period one of its pilots, Flying Officer John Cruickshank, carried out a successful attack on a German U-boat, which by this time posessed heavy anti-aircraft guns. Despite severe injuries, he managed to fly his aircraft home and circled until daybreak before he was able to land it safely, saving his crew, an achievement for which he was awarded the Victoria Cross. Another squadron, 190Sqn, was formed at RAF Sullom Voe in February 1943 tasked with anti submarine patrols over the North Atlantic flying Catalina IB and IV. 190Sqn disbanded there on 1 January 1944. A 190 Sqn Catalina IB preparing for takeoff at Sullom Voe in the winter of 1943. Two spitfires were posted at RAF Scatsta in 1943 in an attempt to deter the Luftwaffe. As the attacking aircraft were still apparoaching low to avoid detection by radar, their posting was of no use and they were soon withdrawn. In October and November 1944 RAF Scatsta was used to support the attack on the German battleship 'Tirpitz'. By that time the airfield had become mainly a maintenance base for RAF Sullom Voe and RAF Sumburgh. Additionally the airfield served as a satellite landing ground for RAF Slumburgh. RAF Sullom Voe was used unil June 1945, when all wartime operations by Coastal Command were halted. Soon after the base and RAF Scatsta were abandoned. 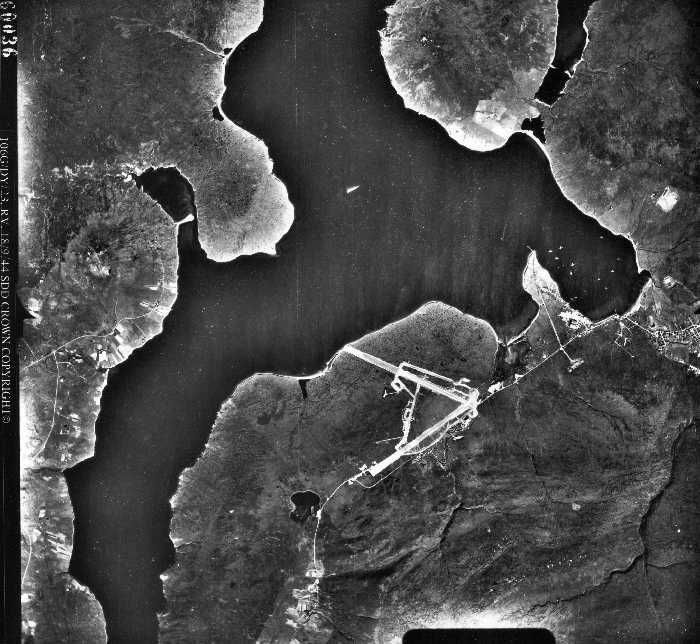 RAF Scatsa and Sullom Voe in 1944. Notice the presence of at least 8 flying boats at Scullum Voe (RAF, Crown Copyright believed to have expired). RAF Scatsa remained as an abandoned airfield and did not see any aircraft, except for an occasional USCG C-130 Hercules that came to service the LORAN beacon that had been established at the northwest end of RWY 13/31 on 24 May 1969. When oil was found in the North Sea it was decided to build an oil storage facility at the location of RAF Sullom Voe. Construction of the terminal began around 1970, and the facility became operational in 1975. It was completed as the largest terminal in Europe in 1982. RAF Scatsta was still abandoned in March 1978. That year, the airfield was reinstated as a civilian airfield to support operations in the oil industry, in particular the Sullom Voe terminal. Ranked by the number of international passengers, it is the fifth largest airfield in Scotland. The figure is flattered though, as this also includes helicopter travel to foreign-registered, but UK-crewed oilrigs in the North Sea. The only fixed wing service operating regularly flies 7 or 8 times a day to Aberdeen. To give the reader an idea of the balance between oil service flights and "normal" civilian flights: the airport service area has no bar (the nearest is some 3 miles (4.8 km) away), nor a taxi or bus service (to anywhere), but it does have three large rooms for helicopter passengers to don their survival suits before embarking. Passengers that do not transfer from/to helicopter flights usually work at the oil terminal at Sullom Voe. A lot of both airfields still remains. Both runways at RAF Scatsta still exist, although only one is in use, the other one is now aircraft parking and helicopter platform . Most of the taxiways still exist, but have been converted for car use. 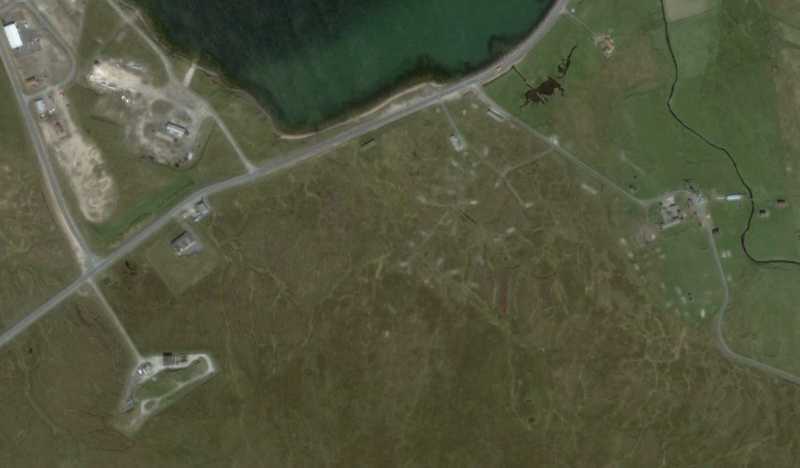 The aircraft ramp into the water at RAF Sullom Voe still exists, as do some of its buildings at Camp Graven, for instance the canteen, some barracks and air raid shelters. From aerial photography it is clear however that many more buildings once existed.